Chiropractic care can strengthen your immune system and help stop a cold before you ever feel the symptoms. 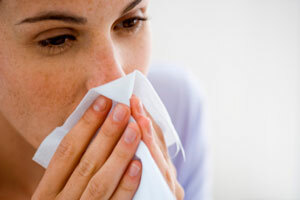 We hear it all the time… “I caught a cold.” But is that really what happened? The truth is, the cold virus and others are always out there, attacking your body. If your immune system is healthy and functioning properly, your body naturally defends itself, fighting off the virus. You usually don’t realize when this happens and just continue to live life as your usual, healthy self. When there is interference in your nervous system, it can get in the way of your immune system function. If your immune system is depleted, you’re unable to fend off the virus. This is when you’ll start to notice the symptoms… the headaches, the stuffy noses, sore throats, and more. It’s possible to have had a virus for three or four days before you begin to feel it, but once it arrives, it’s stressful and let’s be honest, it can be miserable. The way to set yourself up to win the battle against the cold, flu and all the other viruses out there, is to keep your immune system running smoothly. How? 1. Diet: Avoid sugar and eat more fruits and vegetables. The vitamin and antioxidant-rich foods help you fight off sickness. 2. Exercise: Stay active to help boost your immune system and stay healthy. 3. Sleep: Get the rest you need and help decrease your chances of getting sick. 4. Hydration: Get rid of toxins and stay hydrated by drinking water throughout the day. 5. Chiropractic adjustments: Being adjusted when you’re sick may benefit your nervous system and your immune system. With your spine aligned properly, your nerves and entire body have the opportunity to function as designed. This may also help keep your white blood cell count up (the cells responsible for fighting off sickness) so you can feel your best and avoid getting sick. Your body is incredible and designed to heal itself. By taking care of your health each day it’s easier for your body to fight off sickness and feel great! If you want to stay healthy and energetic year round, contact one of our member chiropractors today. « Can Stress Actually Be “Good”?